Year five, day two of the Weyauwega International Film Festival is underway. The day began with breakfast at the B &B with English Documentary filmmakers Jacob Hesmondhalgh and Marie Josephine Hobson. Their film ‘The Family and The Animals’ was filmed in Zimbabwe. The we went super market shopping so they could by snacks and enjoy local flare, Wisconsin cheese and more. It is now 1pm and the Gerold Opera Hostel is bustling. This afternoon starts off with a presentation from film historian Dr. Jack Rhodes. 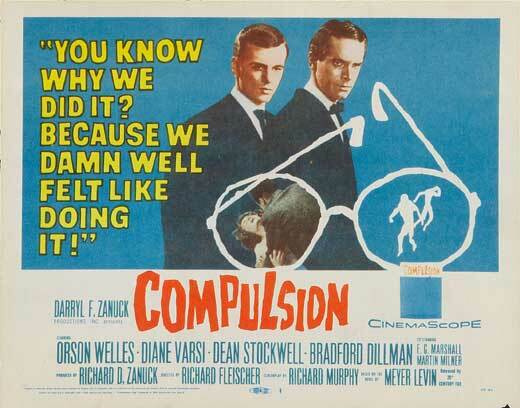 He presents the 1959 movie ‘Compulsion’ starring Orson Welles, Diana Varsi, Dean Stockwell and Bradford Dillman. Directed by Richard Fleischer, Compulsion is set in 1924 Chicago and is based on the historic Leopold and Loeb murder trial. I saw it as a child and many times since. I am looking forward to the presentation. Lot’s of food, snacks, drinks, popcorn and candy sold as film fans and filmmakers make their way into the theater. Dr Rhodes stated he wanted to include this movie showing because his area of expertise in film is from the 20-60s. Edgy, different, studio releases from the classics period. Plus, it is the 100th anniversary of the birth of Kenosha, Wisconsin native Orson Welles. Cannes Film Festival divided best actor among the three, Welles, Stockwell and Dillman. Welles appears at about 67 minutes into the film and has one of the longest uninterrupted courtroom speeches in film history. Similar to television series, Law and Order the first half of the film is about the crime, ‘the crime of the century’; the second half ‘the trial of the century’ the trial. Film also includes recently passed Martin Milner as a featured character in the movie. Other notables include E.G Marshall and Richard Anderson and Gavin McLeod. Made during the era of the production code filmmakers had to find alternative ways to let audience know that the criminal partners were life partners. Daryl F. Zanuck producer chose black and white purposefully and recreated old world Chicago. Checkout the Art Direction and Production Design. The Art Director, Lyle Wheeler, won 5 Academy Awards out of 24 nominations. These were, ‘Gone with the Wind’, Anna And the Kind of Siam’, ‘The Robe’, ‘The King and I’, and ‘The Diary of Anne Frank’. Willian C Mellor, Academy Winner, for Place in the Sun and Anne Frank. Check the credits for all the notable filmmakers who made this film. Among his notable credits is George Steven’s ‘Giant’. Knock yourself out looking everyone up on IMDB.com Then, make sure you check out the film. A wonderful introduction by Dr Jack Rhodes. That plus much more made it a fun afternoon of vintage movie watching. Short program begins in a bit! Just met Milwaukee area author, director Ron Faiola and his producer John Prudlow prior to the screening of their short ‘Tilt-A-Whirls, Cowbells and Beer’ an exploration of Milwaukee area church festivals. Slogan seems to be ‘Drinking for Jesus!’ This is Wisconsin and no one needs a reason to drink OR any reason will do. But ‘drinking for Jesus’ will now remain close to my heart. Faiola is also known for ‘Wisconsin Supper Clubs’ film and the book and ‘Fish Fry Night Milwaukee’. Ron has become known as the filmmaker chronicling Wisconsin and unique Wisconsin happenings and rituals. Ron and Jack fielded questions after the shorts segment. They discussed topics in the film; cost of festivals, weather, safety, dwindling numbers of festivals as a result, drinking, feeding, gaming. and more. Wisconsin has it’s own way of entertaining itself. 10 years ago there were over 200 festivals. Today, that number is down around 120. What is next? The USA/Australian Documentary feature ‘Polyfaces’ features one of the world’s best farms in action. Workers from the farm answered questions during the Q & A. Great discussion on nutrition and sustainable farming practices. These people now have relocated to a new farm in Princeton, Wisconsin. They have a much smaller farm and follow the tenants of Polyfaces. They cater special events and weddings with healthy food. Today represented the 2nd US showing of Polyfaces. It is the first showing since it’s premiere and they chose Weyauwega. It is a fascinating film and following discussion about how we could be eating healthier more often if more farms had conscientious healthy practices. Shorts followed. Director Nathan Deming was in attendance answering questions about his short ‘Dog Days’. The film was his thesis project for the London Film School, in England. Crew working on Dog Days came from Wisconsin, California, Norway, Spain and Lebanon. Deming, graduated the film school and is now working on his first narrative feature about a young man caught up inn a religious organization. Closing the evening will be the documentary feature ‘Peace Officer’ about the increasingly militarized state of American police, as told by former sheriff Dub Lawrence. Lawrence established and trained his rural state’s first SWAT team who later shot and killed his son-in-law 30 years later. A sad, disturbing film on the use or misuse of deadly force. The film ends. Conversation ensues as people make their way out of the Gerold which ends day 2. My English companions Jacob and Marie and I make our way back to the B & B. Turns out Nathan is staying there as well. Perhaps, all four of us will have breakfast tomorrow. I’ll report day 3 tomorrow, similarly as I have today. Tomorrow, Friday the 13th brings out the Spooky movies at Weyauwega International Film Festival and begins the weekend. Come and join the rest of us filmmakers and fans if you can! I’LL UPDATE THROUGHOUT THE DAY SO CHECK BACK IF YOU’D LIKE TO STAY UP TO DATE WITH SOME OF THE HAPPENINGS HERE. 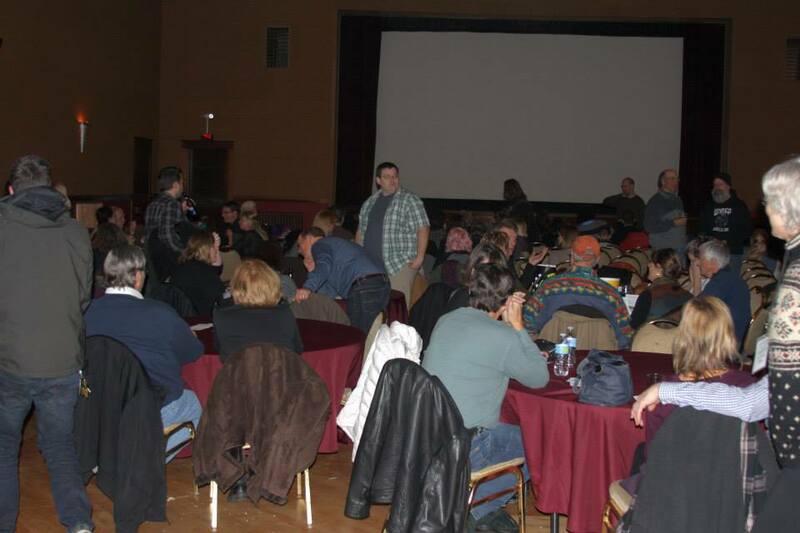 Weyauwega International Film Festival is underway. Shorts have been showing. Nice programming. I’m having an incredibly tasty pulled pork sandwich, cole slaw, and drink at moment. They make good food at the festival. Short subjects began at 4pm. The are presented in blocks. I am eating while waiting for the next short series to begin. Feature begins at 7:30 pm. So far so good. Festival is off to a great start. If you aren’t here you should be. We are at the Gerold Opera Hourse in Weyauwega Wisconsin – just west of Appleton. Come on out! Schedule and info at website link I provided. I finished teaching today at UWM. My guest writer, director Todd Robinson added incredible value to my students and me, and all those who will watch our discussion on youtube. A must! Packed up. Said bye to the students. Left campus and drove a couple hours to Weyauwega. One of the most disappointing moments occurred along the way. I was planning on dining at a friends fabulous Soup Brothers restaurant before leaving Milwaukee, mmmmm; Richard’s food is awesome. I opted instead to drive over an hour and stop at an incredible truck stop diner along the way. There I would enjoy their sumptuous truck driver fare! I’d have breakfast midday and I could barely wait to get some coffee in me too. I pulled into the diner. Walked in. Horror of Horrors. I discover that about 2 months ago they tore it out and converted to a fast food pizza chain. UNBELIEVABLE! I can’t imagine these hungry, burly truck drivers are happy about this. Or anyone else for that matter. WOW and I could have had wonderful soup! Oh well, life goes on. I ate elsewhere, at another small diner along the way. No where near as tasty as the one that vanished but I got some food. A little while later I arrived at the B&B and slept until almost 4 when fest began. I love this B&B. I’ll tell you about it in my last blog post. I know in one of the rooms next to me is or are filmmaker/s from the UK. The food at the festival is delicious. I said that right. WOW this blog is a lot about food. I guess my shock at the diner is unrequited. Drinks come in alcohol and non-alcohol varieties. The people are fans and filmmakers. The films long, short, narrative, and documentary. There is something here for everyone. Friday the 13th is horror film day. The shorts are very entertaining. If you can be here you should be. The cost is right, the films are right, the people right too! You will enjoy yourself, but only if you come on out! Hope to see you! New Filmmaker Video: Inside The Film Business: Riley Dayne​ is the writer, producer & host of the hot new documentary ‘The Abundance Factor’. 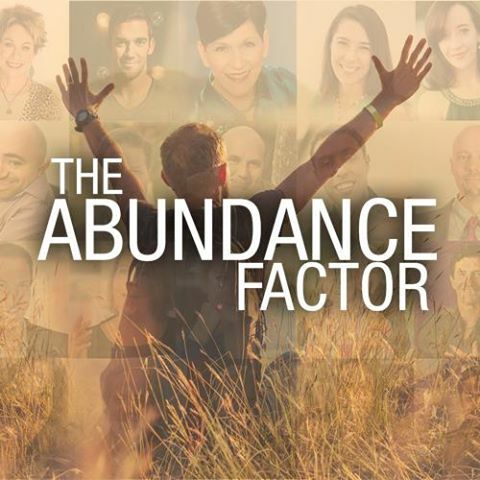 The Abundance Factor Takes You On An Unprecedented Journey into The Minds of The Worlds Most Knowledgeable Experts on the Subject of Abundance and Prosperity. Dayne’s and Sikes’ discussion is filled with valuable information for today’s filmmaker business person!! Watch it today! IF you are interested in Abundance you want to watch to this too! Riley has produced and directed numerous short films and independent documentary projects during his brief time in the feature film world. Shortly after graduating high school with several academic rewards in both the theatrical arts and multimedia production, Riley’s career in the entertainment business began in Los Angeles, where he spent his time studying at the world renowned New York Film Academy. Having graduated from the Digital Filmmaking program (Learning Cinematography, Direction, Screenwriting and Photography), Riley has continued working on his craft by producing & directing various independent film projects. Have you ever wanted to Work with Professional Performers on your ULTRA LOW BUDGET Feature Film and Short Films? Come down University of Wisconsin Milwaukee – Mitchell Hall Room B91 on Sunday November 8th to find out how you, can have SAG actors in you’re projects! All filmmakers and filmmaking students welcome! This Workshop presented by SAG-AFTRA Chicago and Kathy Byrne, (Director, SAG-AFTRA Chicago) will show how you, yes, you, can afford to use professional actors in your low budget feature film! “There is a contract for every budget level. Feature films made for under $250,000 are covered under the SAG-AFTRA Ultra Low Budget Agreement – come find out how easy it is to work with this contract. We also have simple agreements that you can sign to use professional actors in your short films and webisodes as well! If You’ve ever wanted to work with SAG-AFTRA and Equity actors this is a can’t miss event!” Kathy Byrne. UWM campus in Mitchell B91 on Sunday, November 8th at 2 PM. Mitchell Hall is the large building on the NW corner of Downer & Kenwood. Free Street parking or pay parking at UWM Union Parking Structure on Campus. This FREE workshop will provide you a service to highlight the benefits and ease of casting professional actors. SPACE IS LIMITED! Please RSVP by Wednesday, November 4, 2015 to Kathy Byrne at kathy.byrne@sagaftra.org. The Weyauwega International Film Festival will be returning November 11-14 to the Gerold Opera House in Weyauwega for it’s fifth year of films from around the globe. This year the festival presented by Wega Arts will be screening forty-three films representing seventeen different countries. Many of the films were either made in Wisconsin or have Wisconsin connections. This year Friday at the festival happens to fall on the 13th of the month which of course invites an opportunity to screen horror films. The Weyauwega International Film Festival (WIFF) has seized this opportunity to satisfy the horror hounds in Central Wisconsin and will be screening horror films and thrillers all day on Friday the 13th in what they are calling a “Friday the 13th Fright Fest”. Most notable in this line up is the world theatrical premiere of the new feature film DISMEMBERING CHRISTMAS by local filmmakers Steve Golz and Kevin Sommerfield of Slasher Studios. They will be on hand to present their twisted Christmas tale at 9pm. Another Wisconsin film screening on Friday is HAUNTED STATE, a blood chilling documentary which explores the hauntings of several locations in Wisconsin including the Stone Cellar Brew Pub in Appleton, the Pabst Mansion in Milwaukee and locations in Wisconsin Rapids and Merrill. The filmmakers including director Michael Brown of Appleton will be in attendance for the screening of HAUNTED STATE at 3:30pm on Friday. The other Wisconsin film is the psychological thriller THE SCARAPIST which tells the tale of a distraught women who is let astray by a very demented therapist. The writer, director and star of the film, Jeanne Marie Spicuzza is expected to be in attendance for this entertaining thriller which screens at 5:15pm on Friday. For those looking for a good possession tale there are two offerings. IN THE DARK by New York filmmaker David Spaltro offers a very spooky and original demonic possession tale featuring a mostly female cast which screens at 7pm. At 10:30pm LUCIFEROUS promises to raise the chill factor with it’s story about a family that is being tormented by a very nasty entity. This unique tale features a real couple and their daughter as the onscreen family. This especially creepy film has lately been honored with several awards on the festival circuit. Of course WIFF is not all about horror films. Some great feature films and documentaries as well as a wide variety of short films will be screened this year. Wednesday’s lineup includes the documentary THE GOSPEL ACCORDING TO CHARLIE at 5pm about outsider artist Charlie van Ness who started out making a wide variety of art objects featuring phalluses. The filmmaker follows Charlie for several years and his persistence pays off as there are some very unexpected and harrowing developments in Charlie’s life. At 7:30pm on Wednesday the Sci-Fi film EMBERS screens. EMBERS is set in a post apocalyptic world where a global virus has wiped out the memory of everyone it infects. This is no zombie or Mad Max marauder flick, it is a very thought provoking and touching existential tale of identity and what it is to be human. The films follows several characters as each morning they awake with no recollection of the day before or who they are. This film is a real conversation starter and is also beautifully filmed. EMBERS has an encore screening on Saturday, November 14th at 2:15pm. Thursday features the classic 1959 court room thriller COMPULSION about the Leopold-Loeb murder case starring Orson Welles screening at 1:30pm. The film will be introduced by noted Film Historian Dr. Jack Rhodes and it is also a free screening. The documentary POLYFACES screens at 5:15pm and examines the unique and highly sustainable farming practices at the Polyfaces Farm in Virginia. This film is a real eye opener about the potential of sustainable farming and should be a must see for anyone environmentally or agriculturally minded. At 8pm the extremely timely documentary PEACE OFFICER examines the results of the recent surge in the militarization of our police forces. In Utah, a crime scene investigator offers clear and insightful examinations of several extremely violent cases involving SWAT teams. In a sad note of irony, this examiner’s family also becomes the victim of an SWAT raid gone wrong. This film is one of those ‘Must See’ films for anyone who is a citizen of this world. Saturday starts with a filmmaker seminar with local filmmakers Dan Davies, Craig Knitt and Rex Sikes at 10am. An encore screening of the previously mentioned EMBERS screens at 2:15pm. The very entertaining romantic comedy DIRTY BEAUTIFUL screens at 4pm. The documentary about Wisconsin Supper Clubs, OLD FASHIONED screens at 6pm with the filmmakers Holly L. De Ruyter & Brian Risselada will be in attendance and of course Old Fashioneds will be featured at the Gerold Opera House’s full bar. The closing night film is a documentary about the state of photojournalism in Afghanistan. During the Taliban regime all photography was banned and women were severely oppressed. FRAME BY FRAME follows several young Afghani photojournalists who are again facing the threat of another uprising by the Taliban. This film shows a truly beautiful side of Afghanistan that is rarely seen while simultaneously illuminating the dark reality and horror of oppression in a society that seems to be forever doomed. This is an outstanding film and festival director Ian Teal states that this is a ‘must see’ of the fest. FRAME BY FRAME screens at 7:30pm and will be followed by an awards ceremony and reception with complimentary appetizers and of course, conversations about film. The historic Gerold Opera House is celebrating it’s one hundredth year in 2015 and is only about a 25 minute drive West of the valley in Weyauwega and is conveniently located off of HWY 10. There will be soup and sandwiches available for purchase as well as fresh popcorn and a full bar so plan to make a day of it. Tickets are $12 for a day pass which are good for any one film or a whole day of films. Festival passes are $30 and are good for the whole festival and also include a free large popcorn! The full schedule can be found at wegaarts.org. Festival passes can also be found online and at the Book Cellar in Waupaca & at Rural Relics Antiques in Weyauwega. The box office can be reached at 920-867-4888. See you at the Gerold! Those who attended the festival this year – PLEASE share your experience. What is/was your favorite memory, film, conversation, moment, etc. Let us all share with each other. I really want to hear from attendees. When I post I can only post what I experience, but if we each take a moment we can create a fuller living memory of the event. Leave comments in the comment box! Plus, those from past years who couldn’t make it this year can share what they liked from the time/s they did attend. In this fashion we can all enjoy and support flyway even after the festival. SO please start sharing everyone!!! Another early morning working on blogs and then breakfast with Jake and Colette at Six Street String. Good, reliable food and service. Jake and Colette are off to Red Wing for movies all day until this evening. I have work on projects so I am online at The Mineva for a large portion of the day. I need to speak with a S.F. director soon. We have a number of projects we are working on together. I just typed that sentence when he called. We have lots of good news, hooray, and many other things to continue to discuss next week. Later today, I plan to see Vanessa Hope’s ‘All Eyes and Ears’. It will be good to see her and Ted again. I am looking forward to this documentary. From there I shoot, literally, to Alma because I just learned that the narrative feature showing there, stars John McGlothlin. John was one of the stars of ‘Girls Gone Dead’ a feature I co-produced and line produced in Florida back in 2010. The film has had a good life since it premiered. I haven’t see John since beers and burgers in L A 2012 maybe, when we stopped by Hotel Wilshire rooftop. I am looking forward to seeing him in ‘Dusk’. Then I shoot back to Stockholm to catch (again I really mean shoot) Kristjan Knigge’s premiere of ‘Second Honeymoon’. Last evening, his male star, whom I met but can’t spell his name, arrived from Los Angeles. Kristjan begins filming on Monday. Director Zachary Sluser and other’s had to leave today. Fred Thorton and Sean Hackett needed to get back to L A too. These three, among others, really contributed to the fun and the finer aspects of this festival. They will be missed here these next two days. A few of us at the Minema work on computers, others converse, some eat free food and coffee. Others are off seeing films and talking movies. One thing is certain, this is a fantastic festival to be at. I look forward to saying hello to the weekend newcomers. The sun came out earlier this afternoon and it is a beautiful day. I have spent the afternoon working in the Minema. OR SO I thought! A short while ago, I am gently startled awake by Kristjan who quietly whispered , ‘Rex, you are snoring.’ Given the acoustics of The Minema it probably sounded like a hog gunning it on the highway every few moment. Kristjan was being very kind. I responded, ‘I don’t care’, and then promptly defended myself. Ahhhhh, apparently I need more sleep. Thank you Kristjan for attempting to save a man from himself. OR spare the room a noisy distraction. OR both! As of now more people have heard the sound of my snoring more than anyone should in life. This moment of self deprecation brought to you by, ‘I have no idea why’. Just some festival folly. I am not the only one! The rattling snore of another rises loudly in Mineva! I won’t rat out who the other snorer is but suffice to say, I am not the only one. In fact, I am in good company. HA HA! Okay, not much of an update but more of an admission. Cool people hanging in the Minema though. Soon I will hit the road for Alma. I am eager to enjoy Alma, John’s movie and then race back for Kristjan’s. I made the wonderful trip to Alma and was first to arrive at theater. A delightful venue it is. John’s movie was enjoyable. He was good. Impressed with the directors sense of style and transitions. I particularly liked the edit. Once complete I shot out to Stockholm and enjoyed Kristjan’s movie. The theater was packed, standing room only and the film was enthusiastically received. Lead male and female were available for Q &A after showing. Was a delightful night. This film much different from Kristjan’s last offering in terms of style and feel. He an his team shot the movie from concept to wrap production in nine days. Many of the questions afterwards centered around this. Went to Gelly’s for snacks and drinks. Got to speak with Kristjan and congratulate him. Also spoke with Peter McCarthy whose short film Hunter’s Fall was riveting. It’s theme bullying and took place in the Irish countryside. His bullies were wonderfully cast and threatening. Jake and Colette, Jerry and Don, and Vince were at the table. An enjoyable evening. One the way to Mineva, passed deer recently hit, Sheriff handling the wounded animal. 10 miles down the road one jumped in front of my car then leaped into the air, make a beautiful dance move, straight in front of my vehicle. I slammed on the brakes and avoided hitting the animal. Having been cautioned by the preceding hit, I was going slower than I might have otherwise. Everything still ended up on the floor. The Mineva was alive with food, flowing drinks and many new weekend film fan and filmmaker additions. I hung out for awhile but opted to return to work on this and my other blog. An excellent day all around. Tomorrow I will breakfast again at the 6 Street String and return to Alma. I left my cap in the theater, but my plans were to visit there again before the journey home along a wonderful scenic route. Hard to believe the festival will conclude tomorrow but memories will linger and so many of us will already begin looking forward to Flyway #9. UPDATES WILL CONTINUE THROUGHOUT THE DAY AND NIGHT. Please check back for more info on what’s happening. Enjoy! I will!!! AND I did, very much! 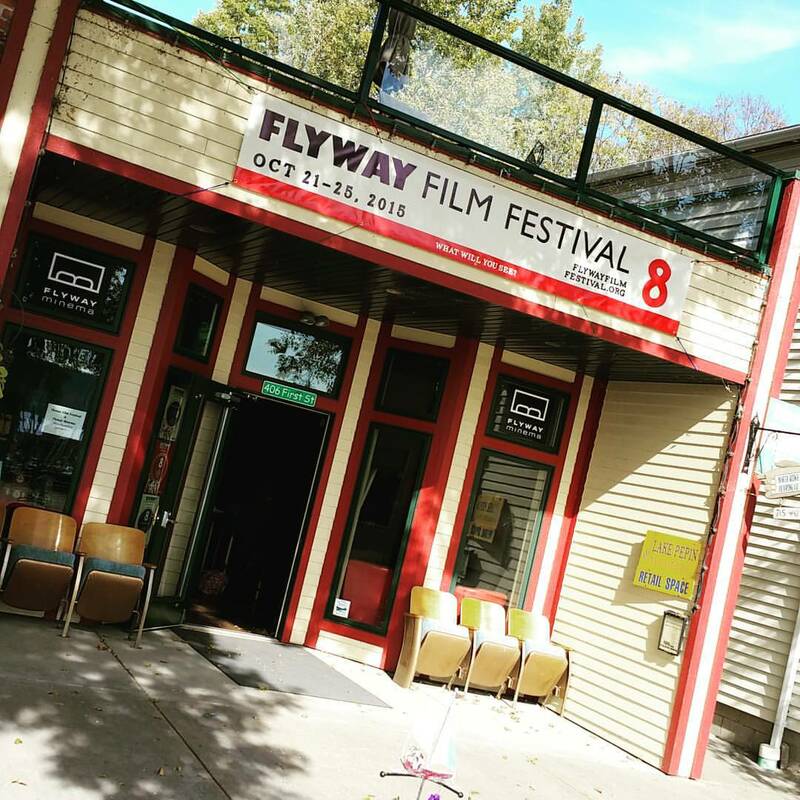 I INVITE Festival Attendees to post comments in the comment section about what their favorite parts of Flyway Film Fest are. Who they saw, films they saw, panels they attended, what they did, where they ate, how drunk they got… you know all the good stuff! Leave some comments here and enjoy! DAY TWO began, for me, at 3:30 am. I write my other blog Daily Inspiration and Gratitude. I wrote and worked until 7:30 am this morning knowing I would then make the gorgeous drive to Maiden Rock during breaking morning light on the Mississippi. I’d arrive in time for 6 Street Sling to open and I’d meet Jake and Colette, Kristjan and gang, David Potter and others for breakfast. I arrived earlier than I thought I would by about 15 minutes. Though a grayer day, not the golden dawn of yesterday, the drive to the restaurant was still spectacular. From there workshops today will be on Location Scouting and Management and Crowdfunding. 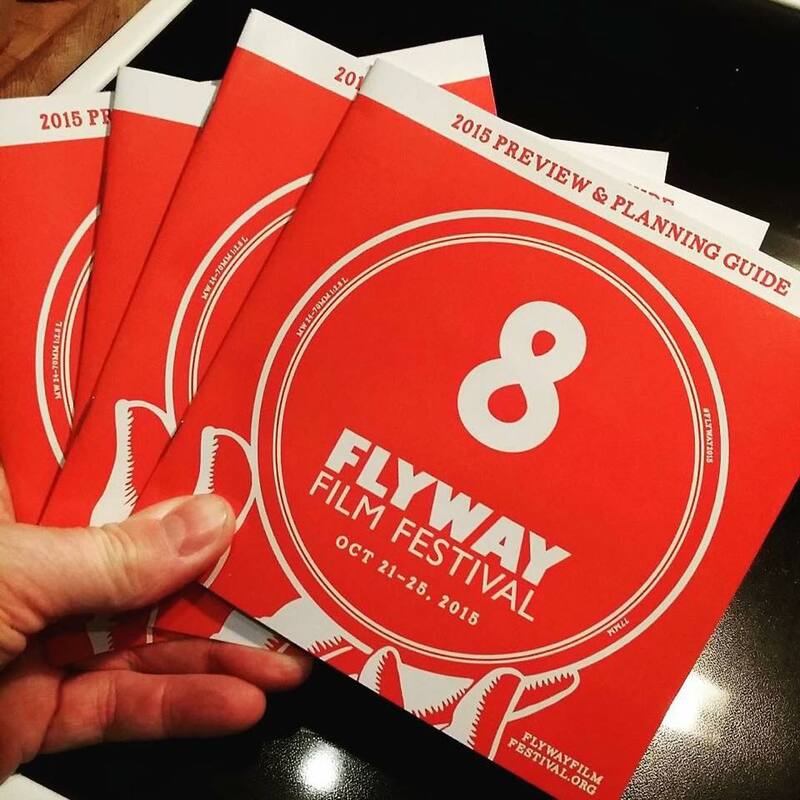 Flyway is firmly underway and a wonderful fest it proves to be again this 8th year. It sprinkles and it is lovely. Jake and Colette arrive. Don and Jerry from Minneapolis join us. David Potter just strolled in. Breakfast is being served. More peeps are coming. We discuss living on houseboats in the Great Loop, nearly 30,000 miles of waterway. Not everything we discuss is film. Breakfast delightful. Conversation centered around saving the world, but we didn’t. Now at venue for workshops. Delightful getting to know the panelist contributors prior to the start of the program. First Workshop: Location Location Location: What does a location manager do? What does a location manager do? How do you become a location scout? How does a location become a character in a film? What should you know when filming on location in a foreign country? Moderated by L A producer Kelly Nathe. Twin Cities-based location manager Charlotte Ariss and Pepin-based location scout Steve Anderson; Danish/English Filmmaker Kristjan Knigge who will shoot a feature in FLyway area at the conclusion of the festival; Emily Ting , who shot her recent narrative in Hong Kong; and Norah Shapiro, who shot her documentary in India; will discuss the roles location played in their films and what they learned from shooting abroad. These experts and location-conscious filmmakers will take you through the ins and outs of finding and getting the most out of your location. They will show examples of shoots they’ve managed in rural Wisconsin and will discuss the roles location played in their films and what they learned from shooting abroad. LOCATION LOCATION LOCATION – Panel 10:30 am Oct 23 What does a location manager do? To give everyone on crew a drama free production. No surprises. Primary liaizon between location owner and production company. Always mind reading because they may received descriptions of room size and footage for dolly runs and type of equipment planned to be used. The Location Scout receives story board, mood photos or description from producers and tries to match up with real world locales. Finding the location is part of the process. Gaining permission is the job of the location manager. Charolette and Steve showed slides of samples of their work. Also must make sure location is returned not damaged and returned to its prior state when shoot is concluded. The L.M. notifies police and neighbors that film crew is shooting so everyone is aware. From director Kristjan the location is not merely a place where things happens but also a character in the movie. Always visit location prior to shoot, between scout and shoot, to see what it is like in real life. How does it speak to you? It isn’t just for knowing benefits and issues of location but to get a feel for it. Emily discussed permits and paperwork options in different cities and countries and addressed location schedule based on budget. Her recent film shot in Hong Kong which required government permissions and permission from the Triad. Her inspiration was to present Hong Kong through loving eyes as opposed to who it traditionally portrayed in film. Nora spoke to shooting with low budget and keeping the story riveting. Here recent documentary was shot in India. She spoke about shooting in India without insurance or permits and how after these agreements were made, the producer tried to shake her down for money not agreed on. Filming always carries with it risks and caveats especially in other countries. All in all a robust discussion from all panelists on making your location choices work for you. A fun and informative discussion with enjoyable visual samples. Lunch at noon. We are back at 6 String. Tasty. After lunch is the afternoon workshop. Whether or not you have had crowdfunding success; or you haven’t tried it yet; the ability to crowdfund has become a fundamental piece of many independent film financing plans. Funding campaigns built upon audience-built connections can last an entire career. This seminar can help you create the action plan most likely to create a lasting, flourishing, direct relationship with your audience. Focuses on crowdfunding but provides you the skills to build a sustainable career. Materials available for free on the Seed & Spark website. Seed & Spark is a Crowdfunding and Integrated Distribution Site. Seed & Spark wants better stories on the screen. In order to have better stories make it to screen you need to be a better business person. The workshop is to help you become a more successful independent business person filmmaker with an engaged crowdfunding audience. 1. What things cost. You must consider cost in advance or needing the funds. 2. Who is your audience? Where are they? How do you get their email address? 3. Your audience must know and understand what your end goal is. Your end goal is the film project. They need to know that is why you engage them. 4. You can survey your followers and social media friends and followers. Crowdfunding begins long before your campaign begins. 5. You set the tone and must be consistent. Persist. You must create momentum and keep going for it. Need to ask realistic budget questions – how much will project cost? how much will incentives cost? 6. It is important that you succeed in your goal so you can deliver the film you promised you are going to make. 7. Think hard about incentives that matter to your audience. Have first day only incentives to start your campaign off with a bang. First week incentives, 2nd week etc. Incentives can be delivered from the start of campaign until after the campaign. 9. Pitch video: The first 15 seconds are for your movie’s audience. Tease your audience with 15 seconds of what you movie is like. Comedy, horror, thriller, action. You have 90 seconds to say everything. Personal appeal is important. 10. Schedule your campaign in advance of it. Stick to your schedule. Remember, this is a business. Learn the business approach and treat everything with that in mind. There were many more important points that Erica made. Questions were answer. A valuable approach that filmmakers can utilize. Great steak and mead dinner in Red Wing. At St James Hotel as festival evening continues. ‘Pictures of Lilly’ premiered to an enthusiastic audience at 7pm. Afterwards, it was to the Minema for food, drink and hanging out. More people have arrived since the weekend is here. I have adjourned to finish this blog post. I have been here for two and a half days and it seems like six or more. The experience has been filled constantly by activity. Day 2 concluded successfully. I am eager for tomorrow.